It has been a very interesting first week of July. We celebrated Canada Day July 1st. We are officially 145 years old as a country. We are also in the midst of the Open Doors/Historic Week Edmonton Festival. Here we are celebrating about 100 years worth of Historic Buildings in the City of Edmonton and its surrounding areas. Also learned a little about the War of 1812. Guess I heard the name when I was in school, but it didn’t mean anything. After hearing someone speak at my Genealogy Group a couple of weeks ago, and watching some documentaries on TV, I realize that had this war not happened, I could be living in a different country today. British and Indians won, well I’m not sure about the Indians, but that is a debate for another time. Americans lost……..eventually Canada came into being in 1867! In this same week, after several years of searching, I have finally connected with living Perkins relatives in England. For so long, I have only been digging up dead ancestors, so finding living relatives……well that is a real treat. With the help of a number of individuals from the Villages of Claybrooke Magna and Claybrooke Parva, I have been able to locate two descendants of Walter Joseph Perkins, my grandfather John Thomas’ brother. Several years ago, I came upon a website called The Claybrookes. I discovered that in 1997, a group from the village had done research on the War Memorial situated in the churchyard. Listed on this memorial was the name William Perkins. 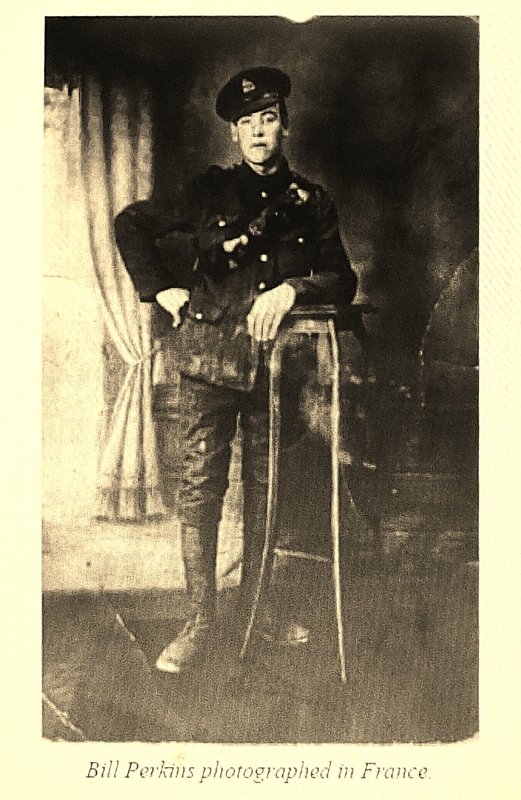 On the website were transcriptions of letters this young man had written home to his sister Elsie Perkins during WW1. Bill was the younger son of Walter Perkins. Elsie and Bill were my Dad’s cousins. Perhaps someone in Walter’s family had descendants still alive in England. 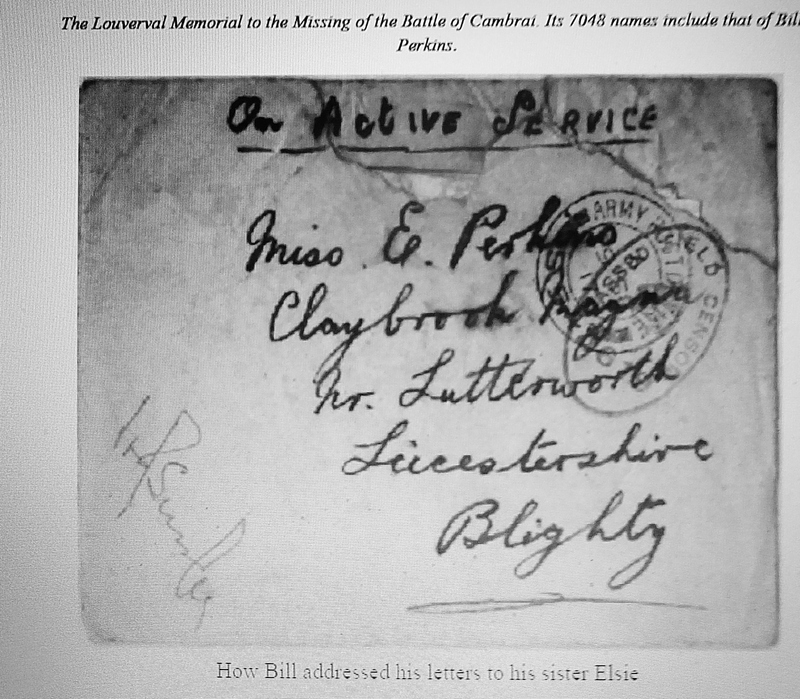 Subsequent research proved that Bill had died at age 19 on the Battlefields of Cambrai in November 1917. He was not married and left no children. His older brother Thomas, was invalided out of the war and died in 1922 as a result of his war injury. He also was unmarried and left no children. The remainder of Walter’s children were girls and so, once married, would not have carried on the Perkins name. I continued my research but without hope of finding Perkins relatives. Through other references to the village, I came across the name Thomas Perkins, and on one source, it said Thomas was living with his Grandfather Walter Perkins. So who was this Thomas, if son Thomas had died in 1922. Turns out, Elsie had 2 children both born during WW1 and prior to her marriage in 1924. Thomas was one of these boys. More searching and I discovered this young man had grown to adulthood in the village. Yes…..I found his marriage in 1944. Children possibly, but how to find them? This was where the various notice boards came in handy. I listed my request to help find Thomas Perkins and his descendants. That was in 2008. Success takes time…..but it happened this week. I have connected with Tom’s son, who still lives in the area, as well as Tom’s grand daughter, who I found via a Public Tree on Ancestry….people who definitely share my gene pool. Old World…New World! Finally a TransAtlantic Perkins connection. Can hardly wait for my next visit to England. Thanks to those who helped to make this possible. I am sure the local, The Pig in Muck, was a busy place last weekend as old memories were raised. Cheers!